Sometimes, just when you think you’ve figured out how something works, you realize that the rules aren’t so hard and fast. That they maybe only apply in certain situations. That, on occasion, you need to break them entirely. Last year, I published this post on cooking with dried beans. In it I describe the soak, drain, cook method of cooking dried beans. I still stand by it for use in certain recipes and especially if you’re looking to replace canned beans. But as soon as I thought that was all I’d ever need to know about cooking with dried beans, I realized that there are some cases in which you don’t need or want to soak your beans. 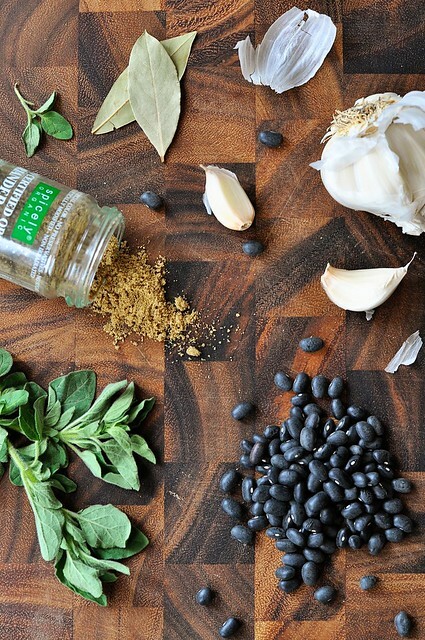 My realization occurred a couple months after that post, when working on a recipe for black bean soup. Every iteration of the soup was good, but it took three tries get it just right. More of this spice, less of that. As it turned out, however, the biggest factor in achieving the soup I wanted wound up having very little to do with seasoning and a whole lot more to do with my approach to the beans. To my surprise, I found that the best flavor and appearance came from unsoaked beans. Things may take a little longer on the stove, but the unsoaked beans leach the ink from their skins directly into the pot (instead of into the soaking water), imparting more of that earthy bean taste and turning the soup a deep, rich brown. 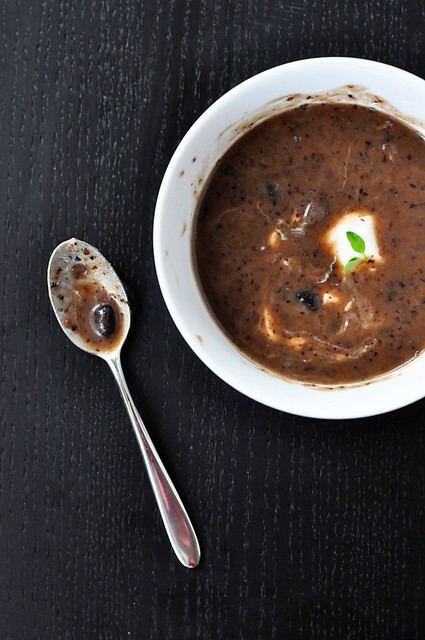 We do eat with our eyes first, after all, and—trust me—a pale black bean soup isn’t quite as appealing. I’ve since learned that you also wouldn’t want to soak your beans when cooking up a big ol’ pot of pintos or red kidneys. There’s so much good color and flavor that you lose into the soaking water. (Although, I suppose you could dump the soaking water into the pot and use it to cook your beans, but something about that doesn’t sit right with me and I’m not always the best at planning ahead.) You may also remember that there’s no need to soak your beans when making these. 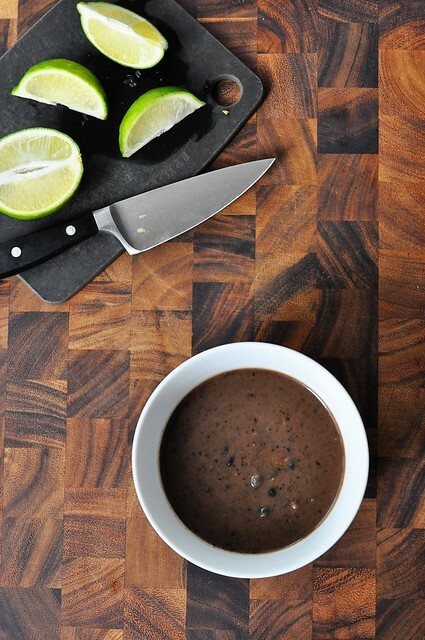 Or, of course, if you decide to make this black bean soup. This healthful soup is seasoned with the citrusy zing of coriander and just a bit of cumin to bolster the coriander’s subtle smokiness. Fresh oregano imparts a lightly floral spice and a splash of lime juice at the end adds brightness and acidity. It’s lovely, really–a pleasing balance of flavors, thoroughly enjoyable whether or not you like to break the rules. This is one of those pots that can really last. It will yield 6-8 servings as written, but you can get nearly twice the mileage out of it if you serve it over a mound of long-grain brown rice. To keep leftovers interesting, try mixing up the garnish. It tastes great with a dollop of sour cream, crème fraiche, or plain non-fat Greek yogurt. Diced avocado, crushed tortilla chips, or a few dashes of hot sauce are wonderful as well. Heat a large soup pot over a medium flame and coat the bottom lightly with olive oil. Add the onions and saute until translucent and lightly golden. Add the garlic and cook for 1 minute, until fragrant. Toss in the diced carrots, celery, bay leaf, oregano, coriander, cumin, and several grinds of black pepper. Saute until the vegetables start to become tender, about 5 minutes. Stir in the beans, vegetable stock, and the water. Bring the soup up to a boil and then reduce the heat to keep it at a gentle simmer. Cover and allow the soup to simmer until the beans are tender, about 3 hours. Once the beans are tender, ladle about 1/3 of the soup into a food processor or blender. Puree until smooth and return to the pot. Simmer the soup, uncovered, for another 15-30 minutes to allow it to thicken. Season with salt to taste. Remove from the heat and stir in the lime juice. 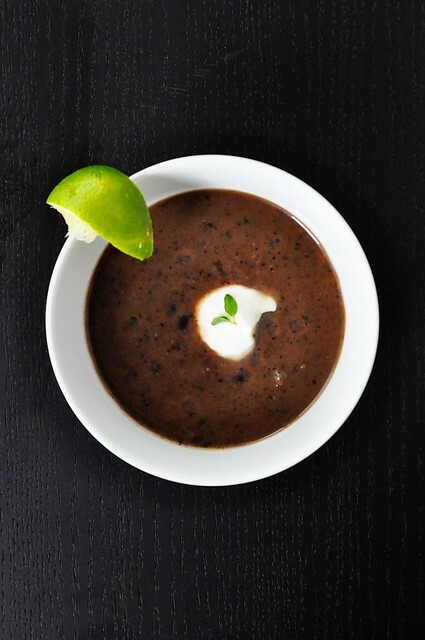 Serve individual bowls with additional lime wedges to squeeze over the top of the soup.